KOKOMO, Ind. – After six delays due to Old Man Winter, the Western Lady Panthers showed it wasn’t just heavy snow that could stop Taylor basketballs from falling through the nets – it could also happen thanks to a strong defense. Ranked No. 7 in Class 3A, the Lady Panthers looked every bit of its lofty ranking in a 67-28 win over Taylor to claim its third consecutive Howard County girls basketball tournament. Already known for its defense after holding Kokomo to a program low 21 points in Memorial Gymnasium earlier in the season, the Panthers forced 35 Taylor turnovers – including 16 in the first quarter. In its first 10 offensive possessions, the Titans failed to get the ball past half court eight times – including a string of seven straight thanks to a relentless and aggressive Western full-court press. “First, the layoffs were a factor for both teams,” said Western head coach Chris Keisling. “An advantage to us was we have a senior-laden team and the experience factor helped recover from the layoff. Utilizing that strong defense, Western led 23-6 after one quarter and stretched the lead to 31-9 at halftime. The Titans could manage just one field goal in each the second and third quarters and turned the ball over 35 times after three quarters. With substitutes in the game for Western, the Titans did not lose the ball in the final stanza while dropping in 16 points – four more than they scored in the first three quarters. 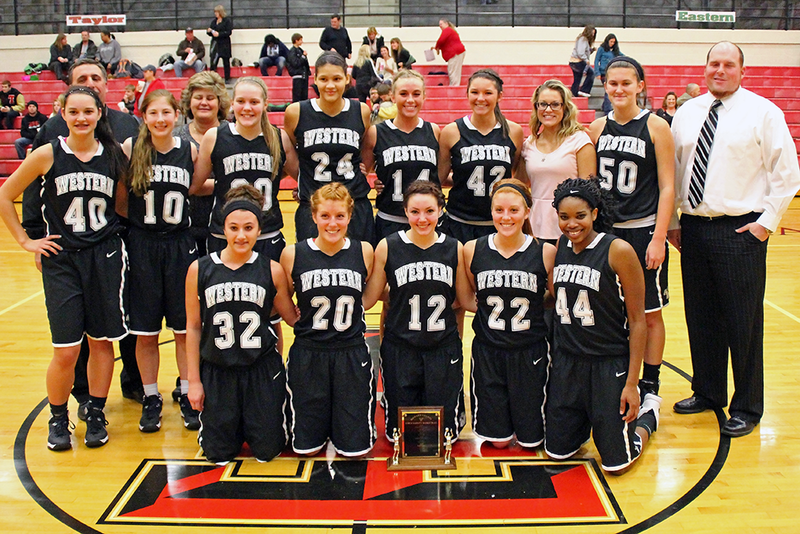 Carley O’Neal led the way for Western with 16 points – including eight in a 26 points third quarter Western scoring explosion that sealed the victory. Raven Black added 11 and Givens dropped in seven. For Taylor, Brie Boehler led the offense with eight points. 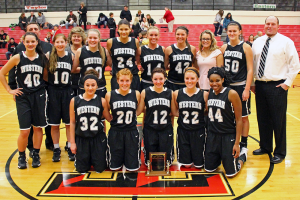 In the consolation game, Eastern upended Northwestern 53-44. Ally Oyler led the Lady Comets with 16 points while Jessie Sprinkles dropped in 13. Abby Oyler added 10. For Northwestern, Brooke Treadway had a double-double of 12 points and 14 rebounds.